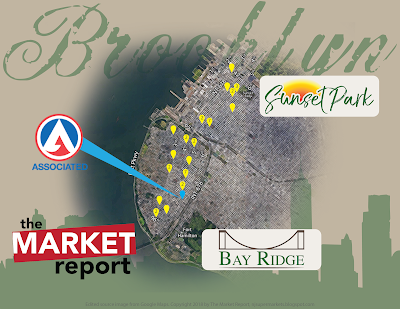 Today's store tour is a small supermarket in southeastern Bay Ridge, which was previously a Pioneer Supermarket but switched to Associated in 2013. 86th St has a very different feel from 3rd Ave or 5th Ave. More traffic and lots of big-chain stores, far fewer mom-and-pop shops. This Associated seems to be really out of place, since people clearly aren't doing their food shopping in that part of the neighborhood. The mildewy awning was the first sign of the state of the store. This is really the side of the store, although the entrance is visible here. Produce and meat line the wall we're looking at, with dairy in the back and deli in the far back corner. The checkout counter lines the front wall. Produce looking over to the checkout. The fact that the checkout is a single counter (more like a drugstore or a convenience store than a supermarket) is telling in how people shop here. If, of course, they're shopping here at all, which it looks like they're not. The Pioneer name is also still proudly displayed on the policy signs near the ceiling. First aisle is produce, meat, and some grocery. I was surprised to see these prepared dinners in this store, although they're likely brought in from a different location. The first aisle is looking pretty good, aside from those random boxes (some full, some empty) stacked here. But that's OK, it was in the morning, so maybe they were beginning to stock for the day. That might be a little hopeful, as we'll soon see. Bread at the end of aisle 1. Uh, where's the food? That little sign says "Keebler $6.99". Most of the grocery shelves were pretty sparsely stocked. Although, strangely enough, all the perishable departments were packed with selections. Funny, because usually it's the reverse. And unlike Shop Fair, the store was not in the process of opening or closing. The deli department is tucked away in the back corner, in what was probably part of the backroom space or another business at one point. It's a nice enough deli, but (1) look at the shelves to the left of it, and (2) what if you want to order something? There was nobody! A look down the last aisle, with frozen foods lining the outside wall. Not much tea, if that's what you're looking for. 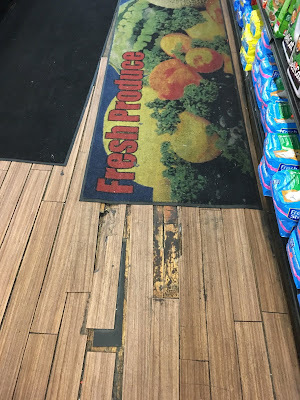 Why is the floor in such bad condition for a store that was obviously renovated relatively recently? It had to have been done very cheaply for the flooring to literally be separating from the ground in multiple places. And sure, it can be fixed by putting a Fresh Produce rug over it in the frozen foods aisle. One more look at frozen before we head out. It's hard to tell how (or why) this Associated stays in business, but I guess it wouldn't still be open if it weren't making money. I just wouldn't recommend shopping here!